T – Art for Art's Sake! Born in Donaghadee, Co.Down. Studied at the Belfast College of Art, and the Leicester College of Art. “Pierrot at Mount Stewart” oil on canvas (35″ x 24″) sold at Morgan O’Driscoll’s – 2/8/2016 for €2,800.00. 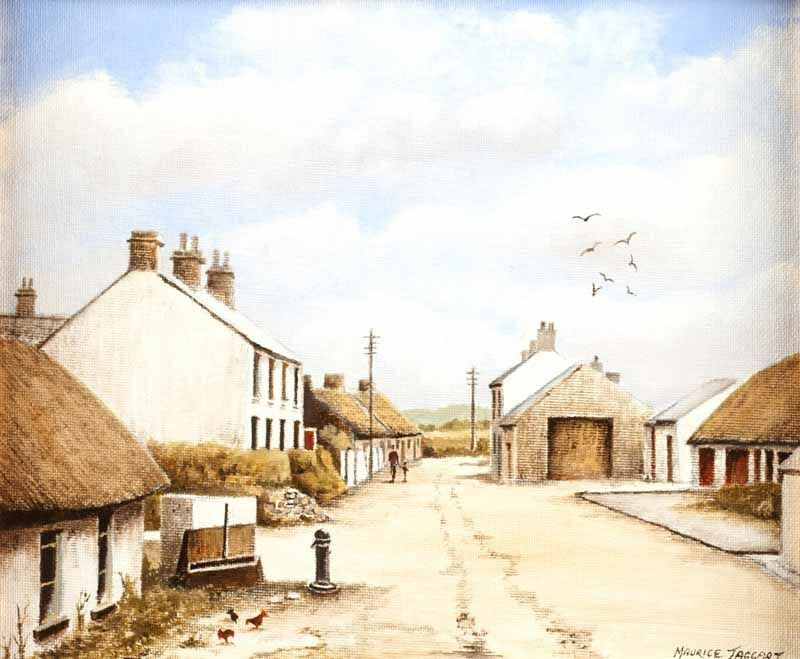 “Boneybefore, Carrickfergus” oil on board (10″ x 12″), sold at Ross’s – 7/11/2012 for £50. 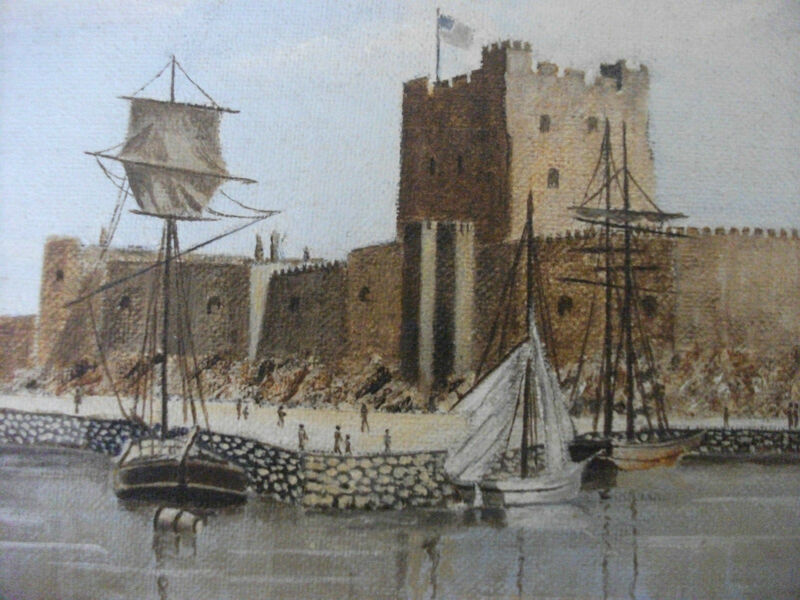 Left to right: “Scrabo Tower” oil on board (10″ x 8″), unsold at Ross’s – 31/5/2017; and “Carrickfergus Castle: from a 19th century print” dated 1983, oil on canvas board (8″ x 10″). 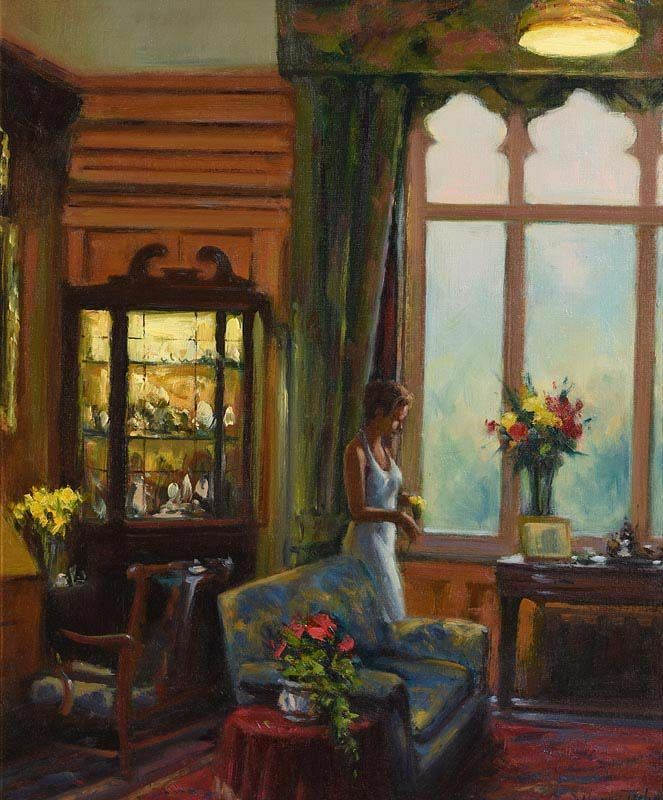 Anne Tallentire was born in Co Armagh and has lived and worked in London since 1984. She studied Fine Art Media at the Slade School of Art from 1986 to 1988 and is currently a Professor of Fine Art at Central Saint Martin’s College of Art & Design. 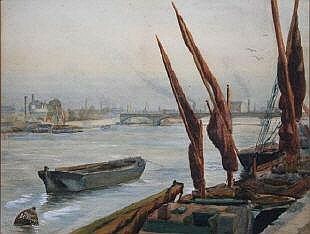 Some of her early paintings were used in a series of John Hinde Art postcards and calendars. 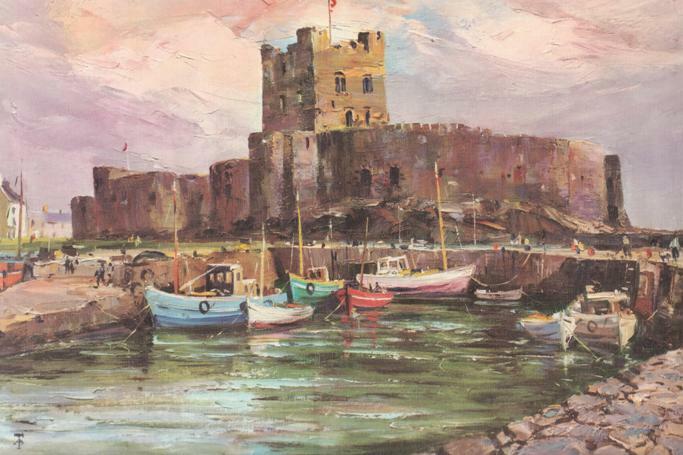 Above: Carrickfergus Castle from a 1970 Munster & Leinster Bank calendar. 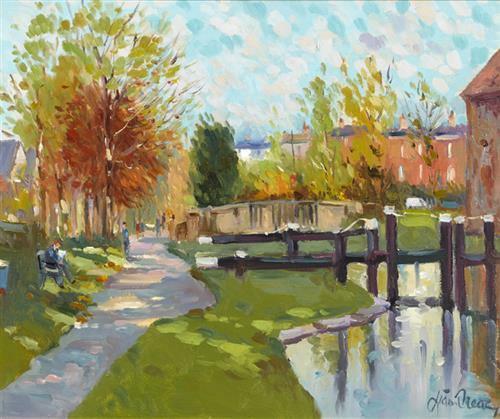 “Houses by the Grand Canal” watercolour sold at James Adams 1/6/16 – €220.00. 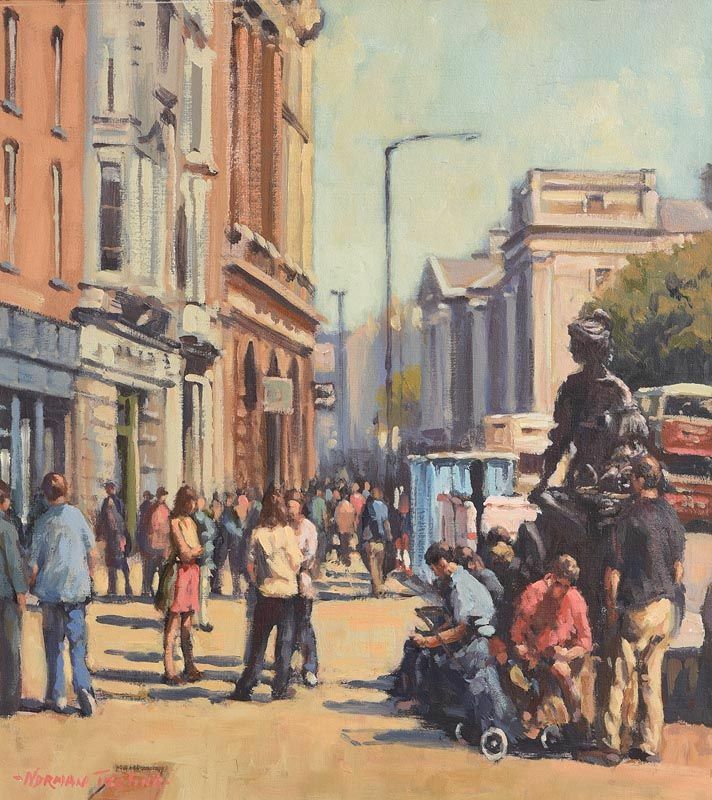 “Enniscorthy” oil on canvas (15″ x 30″), sold at Morgan O’Driscoll’s – 13/3/2017 for €300.00. 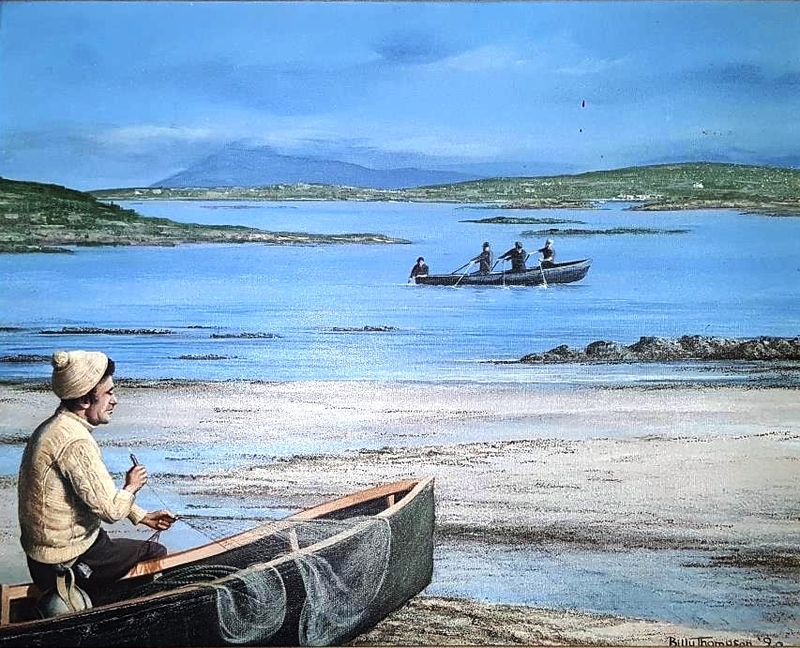 “Connemara“(16″ x 23”) watercolour. 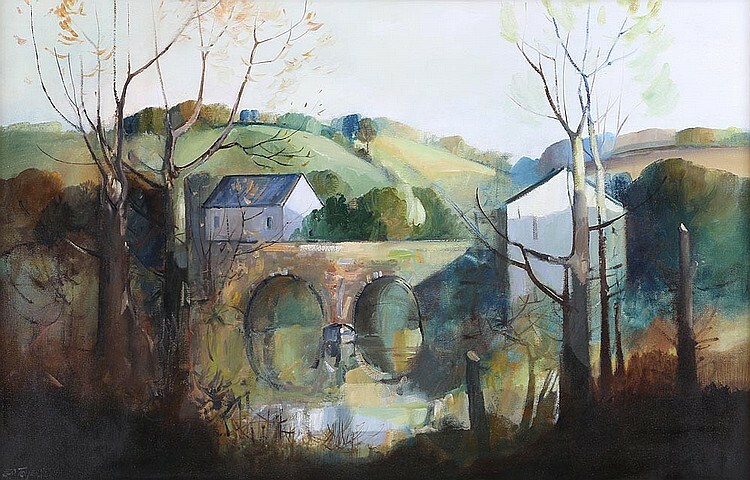 Sold at Wotton Auction Rooms, Gloucestershire 7/2016 for £220.00 along with two Irish prints and on its own at Morgan O’Driscoll’s – 6/3/2017 for €600.00. 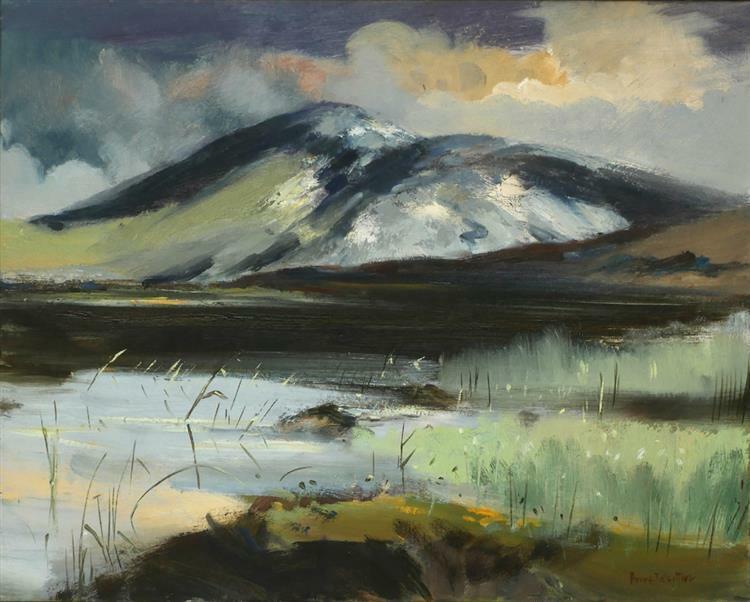 “Silver Mountain, Maam Cross, Connemara” oil on canvas (16″ x 20″), unsold at Whyte’s – 23/10/2017. 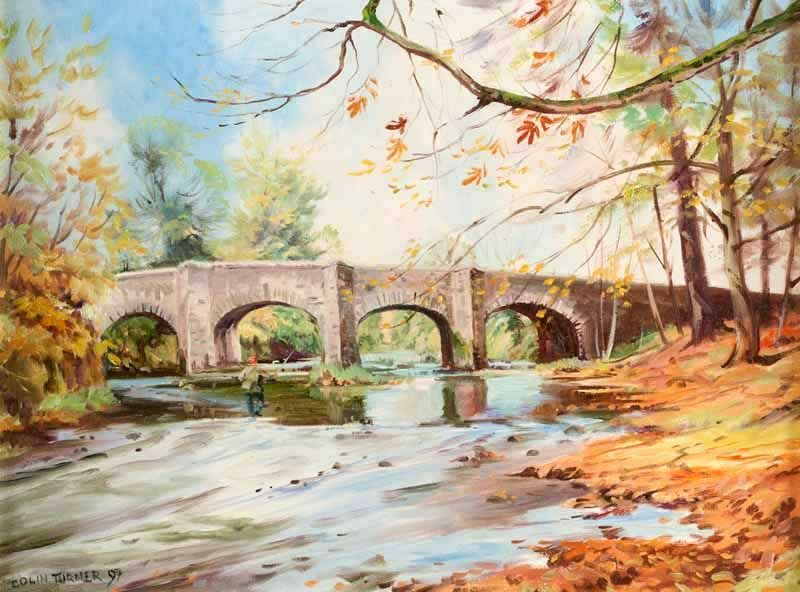 “The Old Bridge, Enniscorthy” oil on canvas (15″ x 30″), purchased July 2018 (after auction) from Ross’s for £140.00. 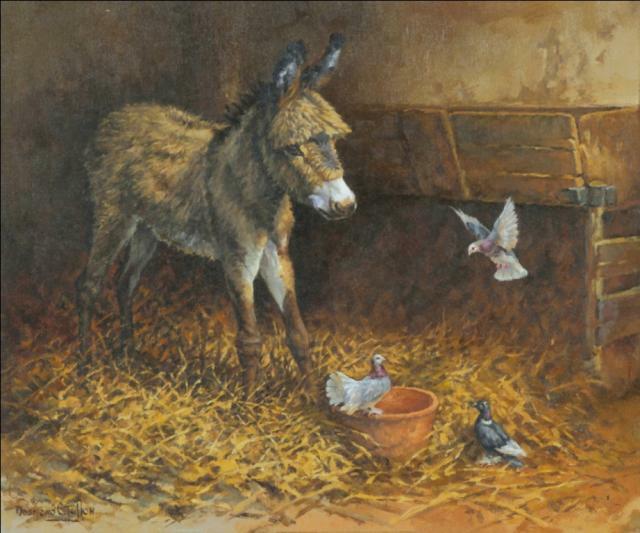 “Young Donkey” oil on board (9.5″ x 11.5″) sold at Dolan’s – 6/2/2011 for €850.00. 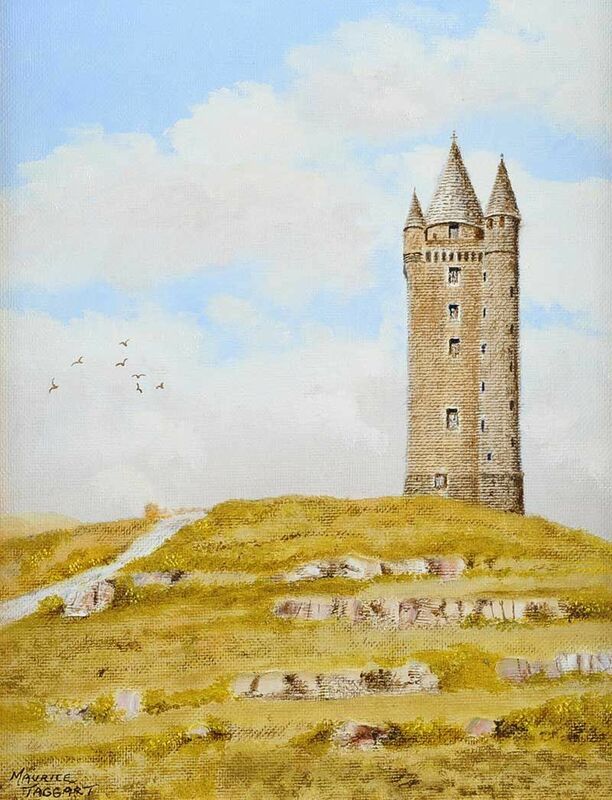 “NCB Ireland” oil on canvas (24″ x 36″) sold at Morgan O’Driscoll’s – 7/8/2018 for €2,600. 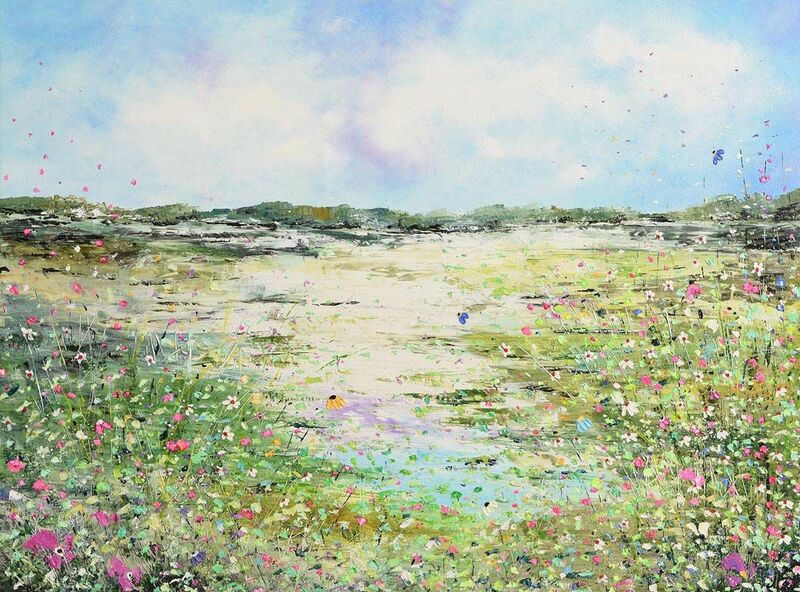 Jayne Taylor is a self-taught artist from County Cork. 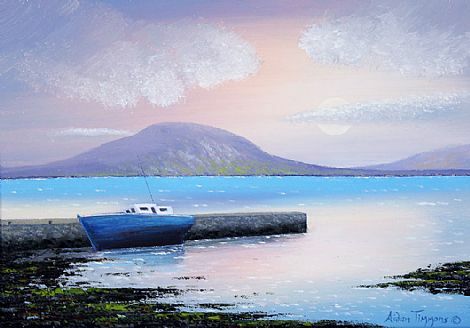 “Seaford, Co.Down” acrylic on canvas (29″ x 40″), sold at Morgan O’Driscoll’s – 13/3/2017 for €500.00. “Beside the Boyne” oil on canvas (14″ x 18″). “Summer, Co.Wicklow” oil on board (11.5″ x 17.5″), sold at Morgan O’Driscoll’s – 2/10/2018 for €200.00. Rosemary Taylor graduated in Fine Art as a mature student from the Crawford College of Art, Cork in 2004. Left to right: “Study of a Woman” oil on canvas (20″ x 15″) sold for €634.00 – 8/3/2000; and “On the Lagan” dated 1894, watercolour (11″ x 15″). “The Chinese Bowl” oil on canvas (14.5″ x 21″), unsold at Whyte’s – 17/7/2017. 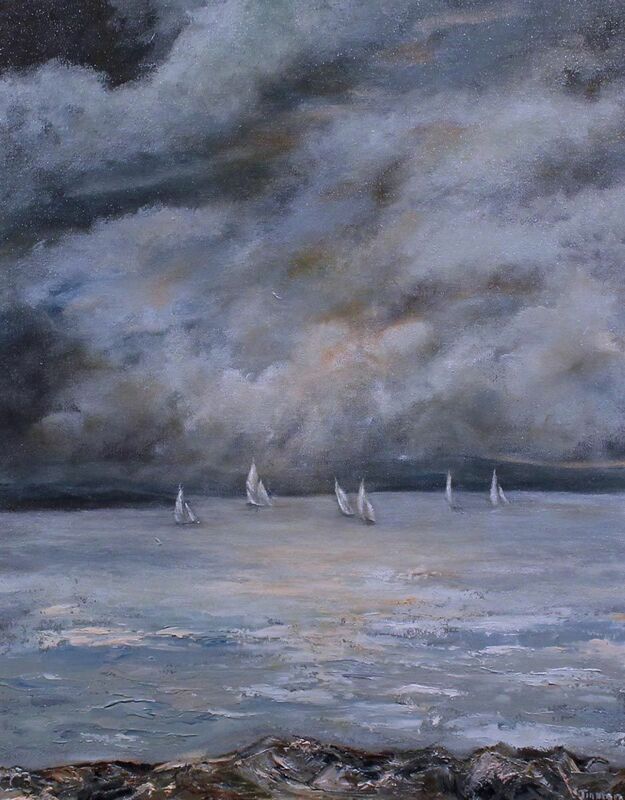 “Swords Estuary” oil on canvas (10″ x 14″), unsold at Morgan O’Driscoll’s – 28/1/2019. “Molly Malone” oil on board (20″ x 18″), sold at Morgan O’Driscoll’s – 12/9/2016 for €900.00. Left to right: “Royal Canal” oil on board (20″ x 24), sold at Adam’s – 31/5/2017 for €850.00; and “The Drawing Room” oil on canvas board (23″ x 19″), sold at Morgan O’Driscoll’s – 8/8/2017 for €1,000. 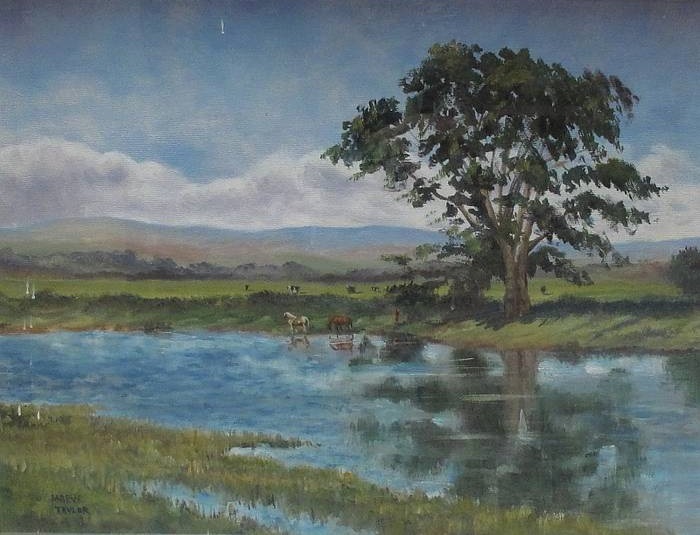 A South African artist now living and work in County Wicklow. A high quality painter of Wildlife, People & Places and much more. 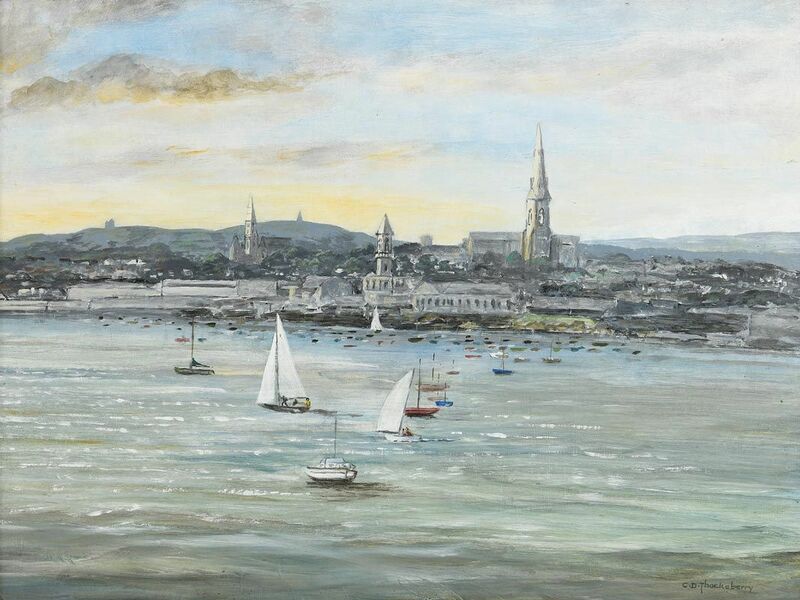 “Dun Laoghaire Harbour” oil on board (19″ x 25.5″), sold at Morgan O’Driscoll’s – 19/3/2019 for €360.00. “A Sheep Pen” oil on board (25″ x 30″), sold at Morgan O’Driscoll’s (RDS) – 10/4/2017 for €5,200. Left to right: “Portrait of a Lady” oil on canvas (16″ x 12″), unsold at Ross’s – 28/6/2017, and “Portrait of a Gentleman, 1895” oil on panel (10″ x 7.5″), unsold at Whyte’s – 9/7/2018. 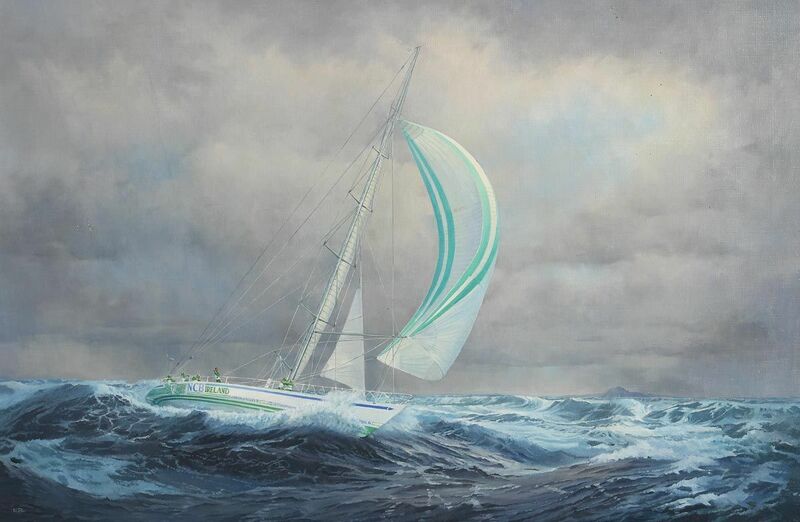 “Winter Wind, Toormore Bay, West Cork” dated 2010, oil on canvas (33″ x 46″), sold at Morgan O’Driscoll’s – 23/1/2017 for €700.00. “Autumn Sunset, Toormore Bay” oil on canvas (16″ x 16″), sold at Morgan O’Driscoll’s – 23/10/2017 for €360.00. 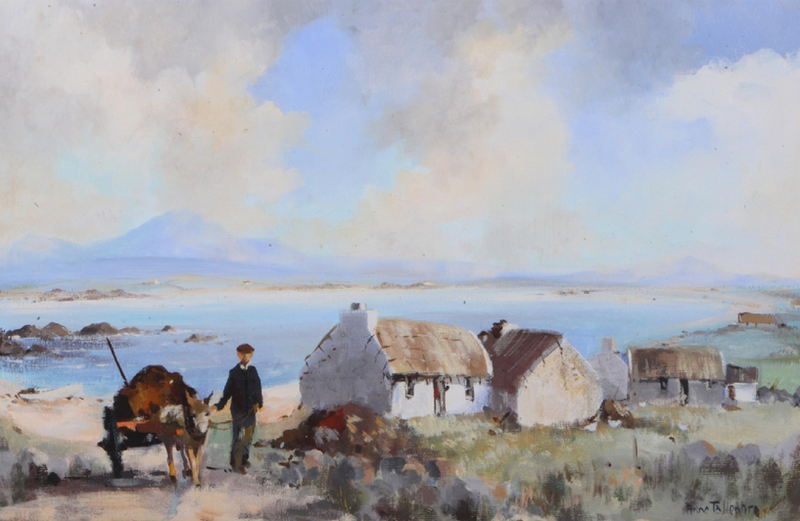 “Aran Island Coracles” dated 1990, oil painting sold with another similar at Ashgrove Auctions – 26/5/2018 for €100. 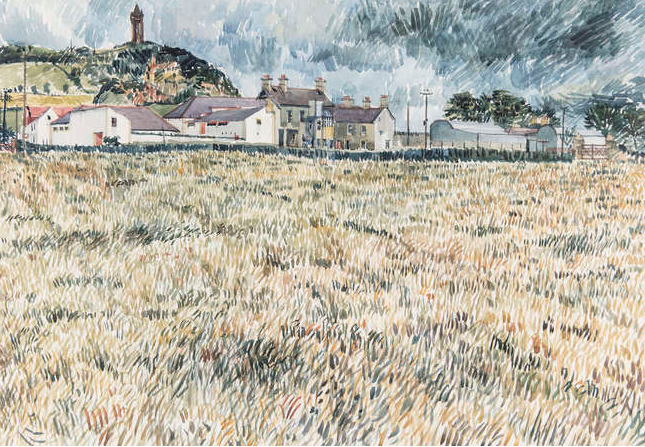 “Scrabo Hill, County Down” 1978, watercolour (16″ x 23″), sold at Adam’s – 27/9/2017 for €180.00. 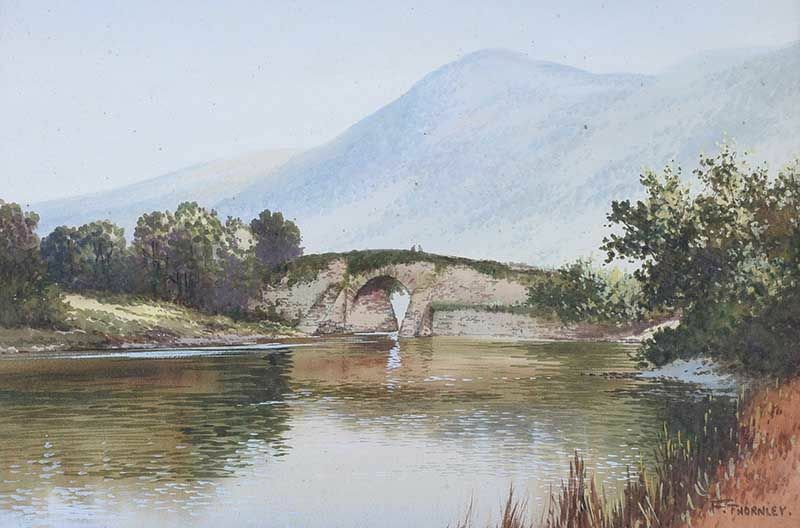 “The Stone Bridge over the River” watercolour drawing (12″ x 17″), sold at Ross’s – 13/3/2019 for £50.00. 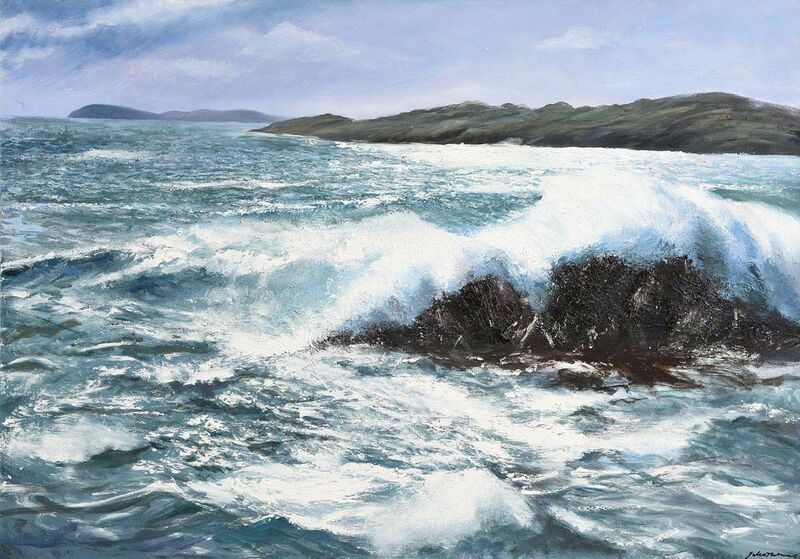 Fine Art Original paintings from West Cork. Mediums include watercolour, pen and ink, oil painting, acrylic, mixed media and sculpture. Thorn’s style ranges from classical to abstract, fantasy to realism. 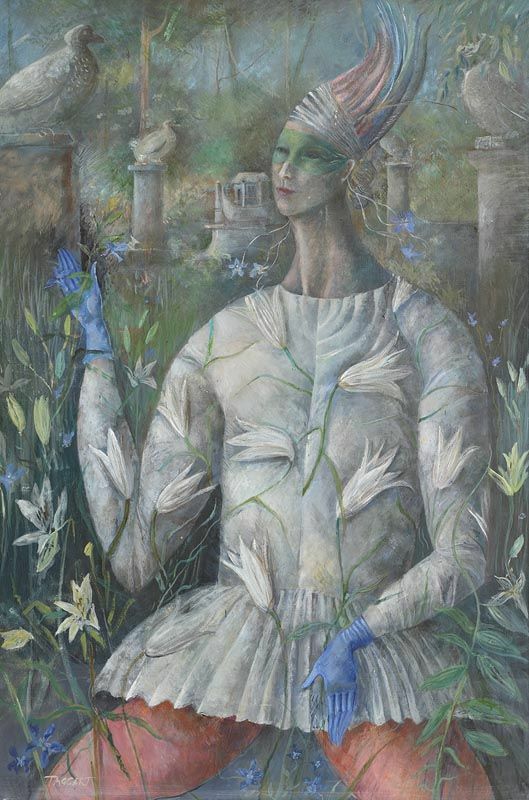 Her artworks move through figurative art, landscapes, seascapes, historical and mythological art, internal emotional landscapes and reflections. 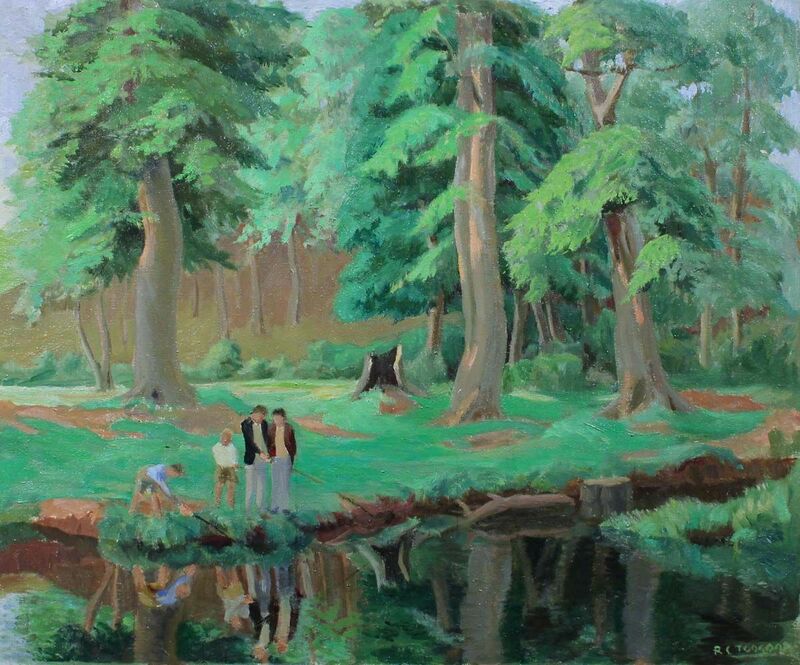 “Tollymore Forest“. © Down County Museum. 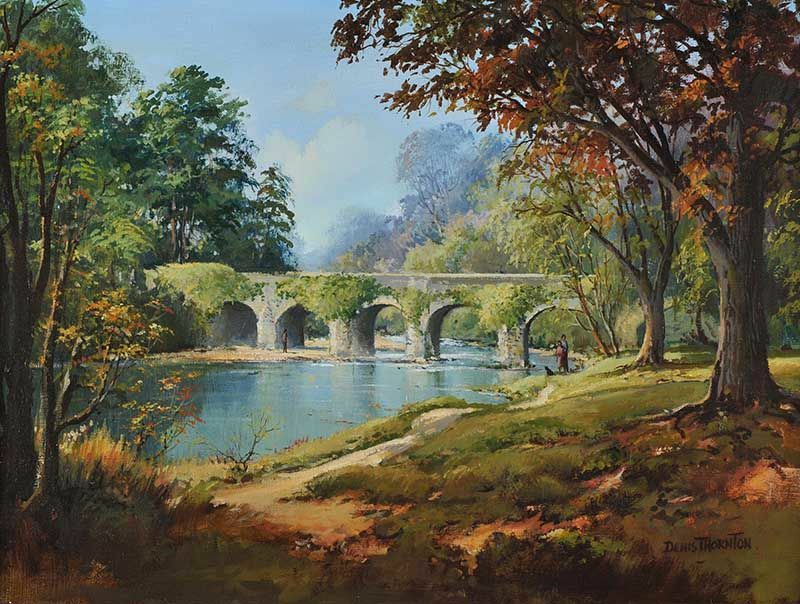 “Bridge at Six Mile Water” oil on canvas (18″ x 24″), sold at Ross’s – 5/10/2016 for £200.00. 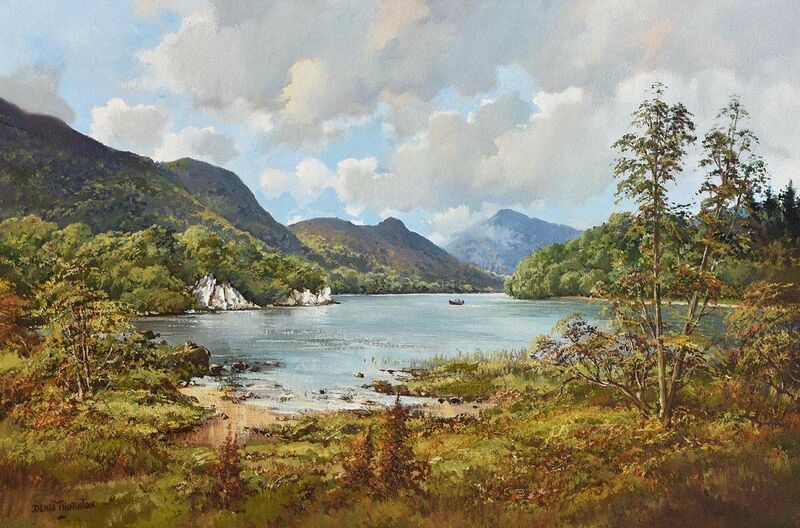 “Muckross Lake, Killarney” oil on canvas (20″ x 30″), sold at Morgan O’Driscoll’s – 14/8/2017 for €460.00. 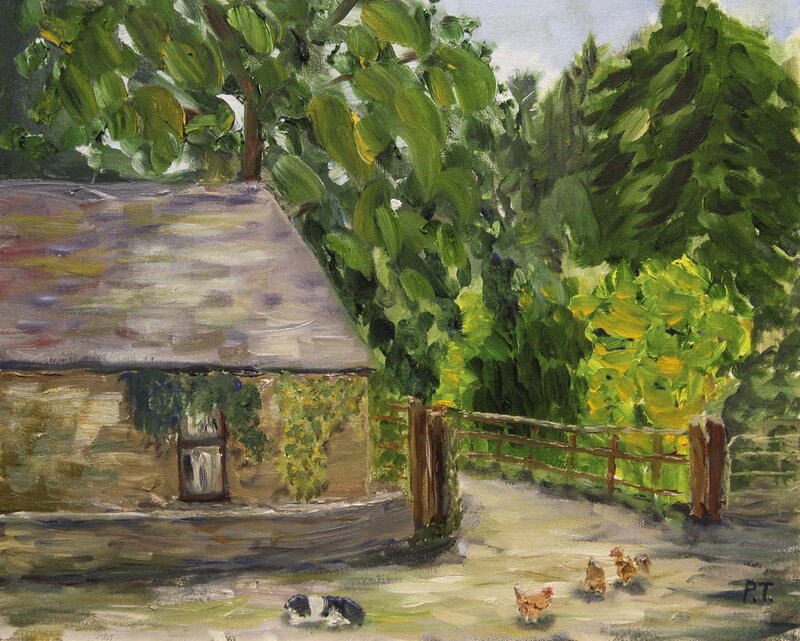 “Wicklow Farmyard” oil on canvas (12″ x 16″), sold at de Vere’s – 18/7/2018 for €90. A fine commercial artist based in Dame Street, Dublin, who produced poster artwork for the Great Southern Railways. Till’s posters are amongst the most sort after of Irish railway posters and one can expect to pay €1,200-1,500 for examples such as either of the above. 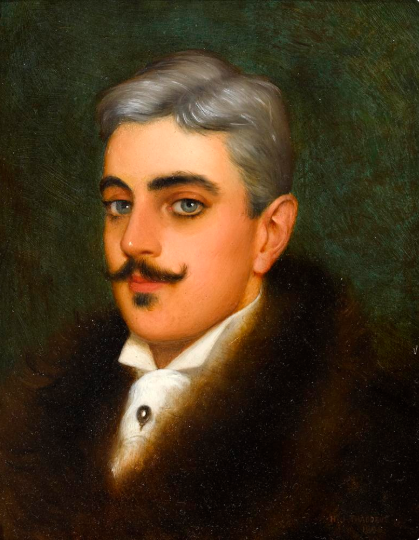 Where did the original paintings end up? 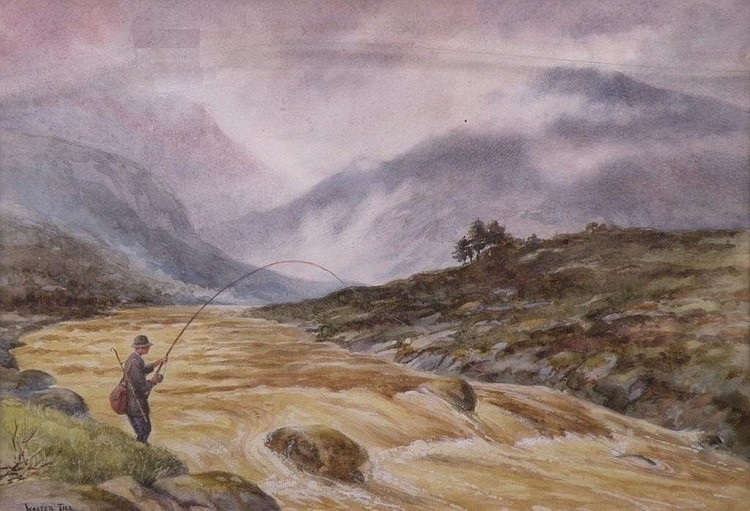 “The River Foiw, County Donegal” signed watercolour (10.5″ x 15.5″), which turned up at Halls, Shrewsbury in 2009 and at Morgan O’Driscoll’s on the 6/6/2010 – more information to follow. The name of the river seems like an error in transcription? “The Pier” oil on canvas (10″ x 14″), sold at Gormley’s – 13/9/2016 for £150.00. “Near Roundstone” oil on canvas (10″ x 14″). “Running Home, Belfast Lough” oil on canvas (20″ x 16″), unsold at Gormley’s – 16/5/2017. 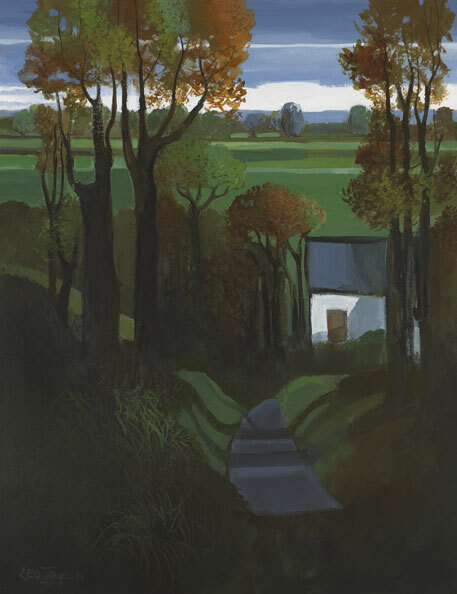 Fermanagh born artist, Jo Tinney studied at Belfast College of Art and the Manchester University School of Art before returning home to teach Art and Design in Enniskillen Convent Grammar School. 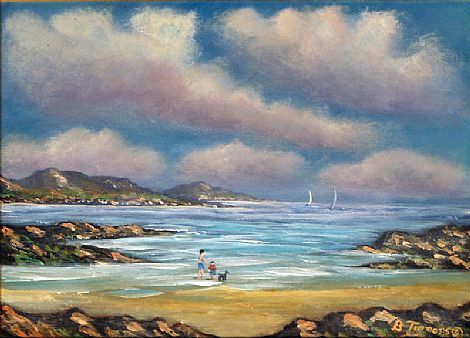 In 1985, after teaching for eight years, she became a full time artist. Visitors to Enniskillen are welcome to call at her own Studio/Gallery in The Buttermarket, Enniskillen Town Centre, Co.Fermanagh. “Stormy Seas” watercolour (6″ x 14″) – one of many fine paintings available from the artist’s gallery. 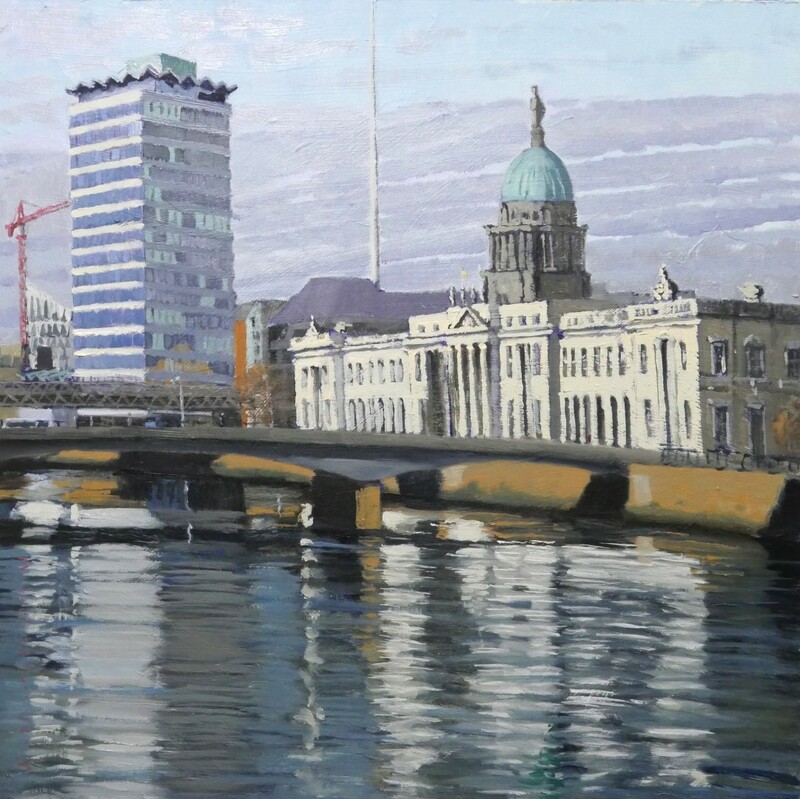 Gregory Toal studied at the National College of Art & Design and the College of Marketing and Design in Dublin in the 1980’s. He was greatly influenced by Flora Mitchell, Liam Martin and Edward Hopper. 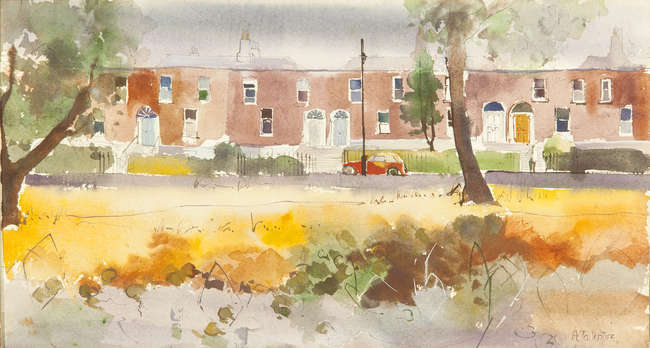 He developed an individual style in pen and watercolour while studying at NCAD. 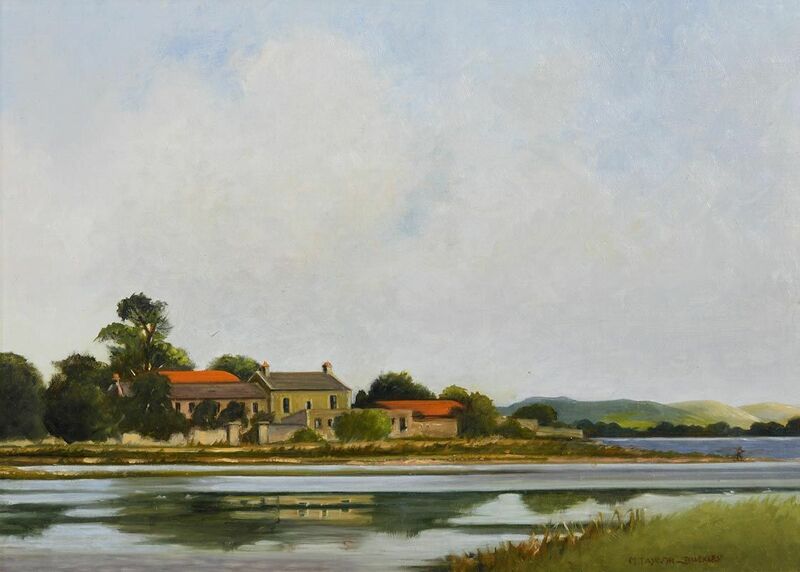 His latest works are acrylic interpretative landscapes, beaches and rural scenes, depicted in warm expressive colours. 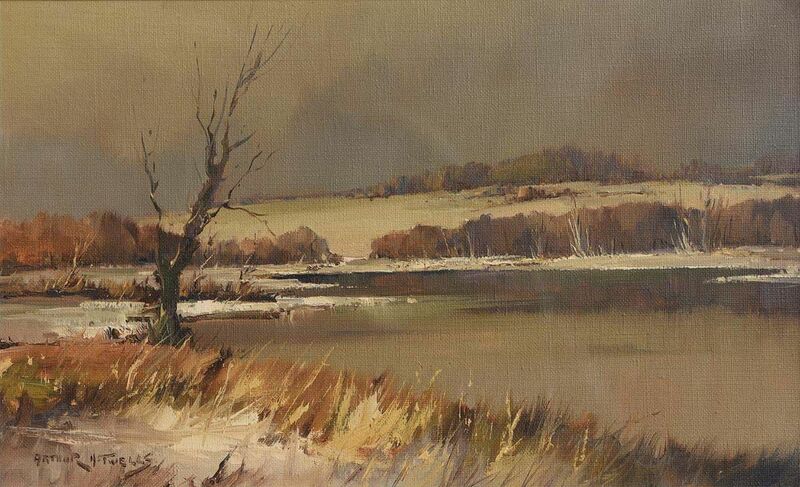 A self-taught artist from Coleraine, County Derry. 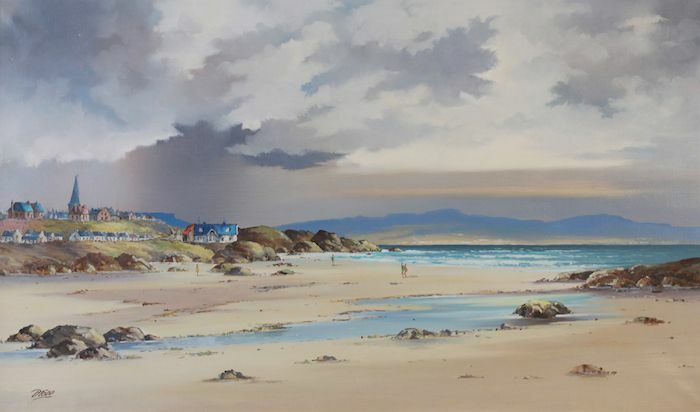 “Castlerock Strand” oil on canvas (18″ x 30″), sold at Ross’s – 30/1/2014 for £340.00. 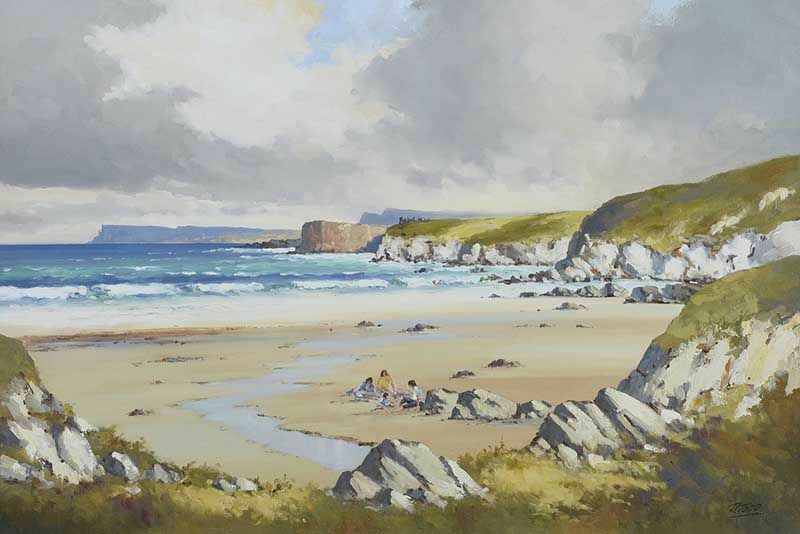 “Picnic, The White Rocks, County Antrim” oil on canvas (20″ x 30″) , sold at Ross’s – 21/2/2018 for £340.00. “Seated Girl in a Blue Dress with Flowers” pastel (36″ x 24″), unsold at Adam’s – 28/9/2016. “The Minnowburn County Down 1965” oil on canvas (20″ x 24″). “Satsumas” oil on linen (18″ x 20″), sold at Morgan O’Driscoll’s – 13/3/2017 for €420.00. 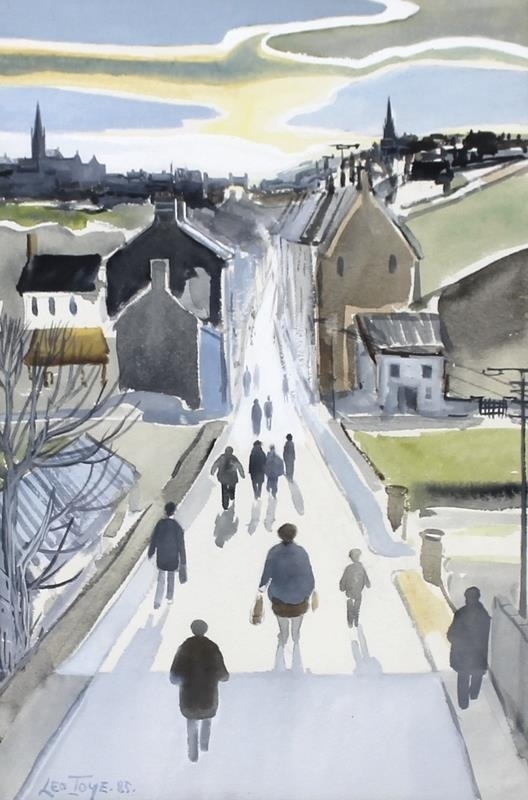 Left to right: “Clones, Ireland” 1985, watercolour (12.5″ x 8.5″), unsold at Bateman’s, Stamford, Lincolnshire – 2/12/2017; and “Laneway” dated 2011, acrylic on canvas (18″ x 14″), sold at Whyte’s – 12/3/2012 for €700.00. “Hillside with bridge” oil on canvas (20″ x 30″), unsold at South Bay Auctions, New York – 24/6/2017. 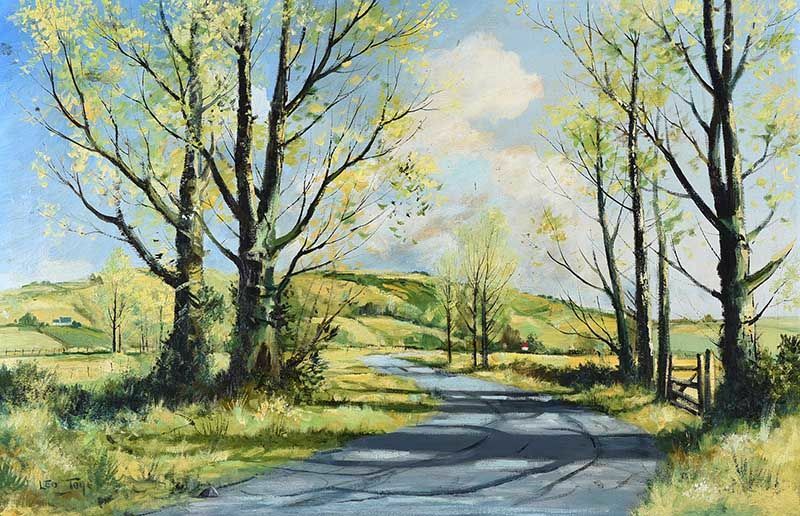 “The Bend in the Road” oil on canvas (20″ x 30″), unsold at Ross’s – 10/4/2019. Darragh Treacy was born in 1973 and raised in Avoca, County Wicklow. 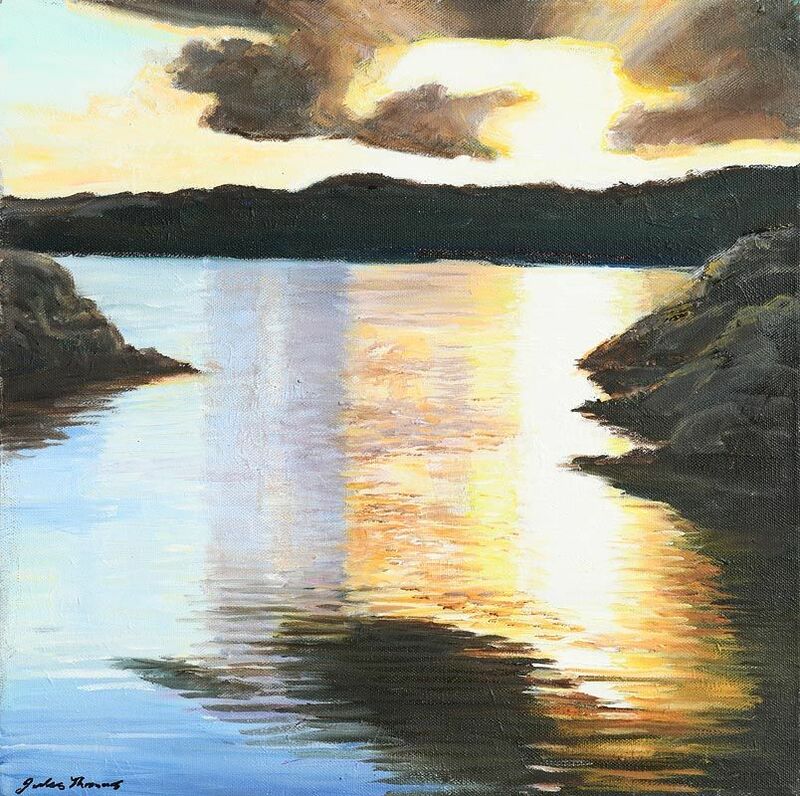 A largely self-taught artist who favours the use of oils with an impressionist style. 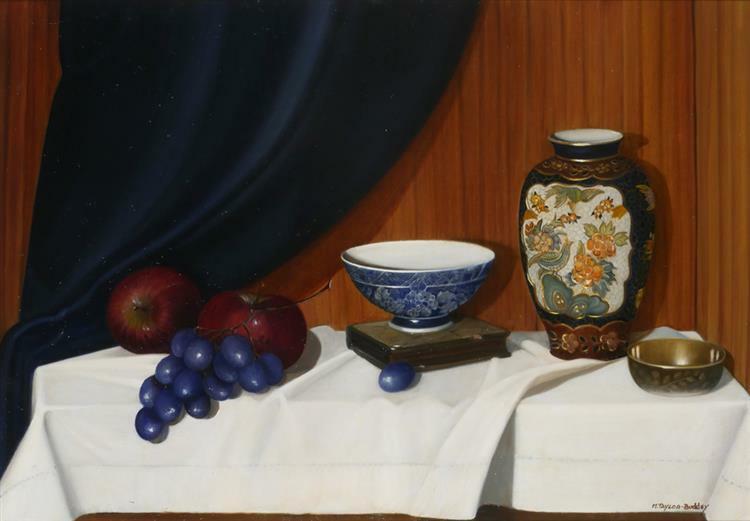 His subject matter is varied and includes still-life, landscapes and street scenes. 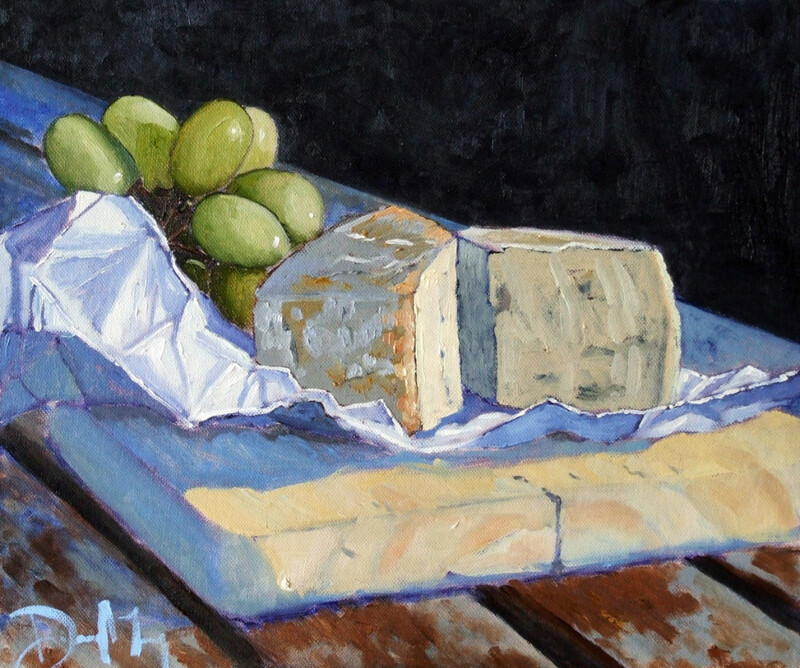 Left to right: “Cheese and Grapes” oil on canvas; and “Winter Light, The Liffey” oil on board (19.5″ x 19.5″) – exhibited at the Dublin Painting and Sketching Club exhibition in April 2018. 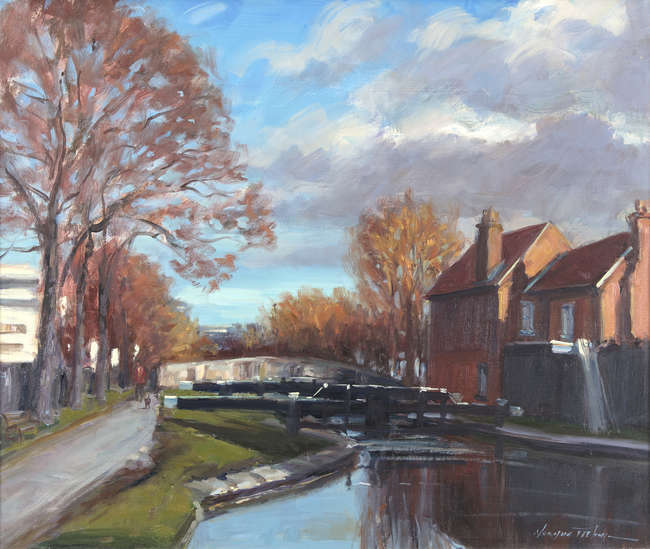 “Canal lock at Percy Place, Dublin” oil on canvas (20 x 24). 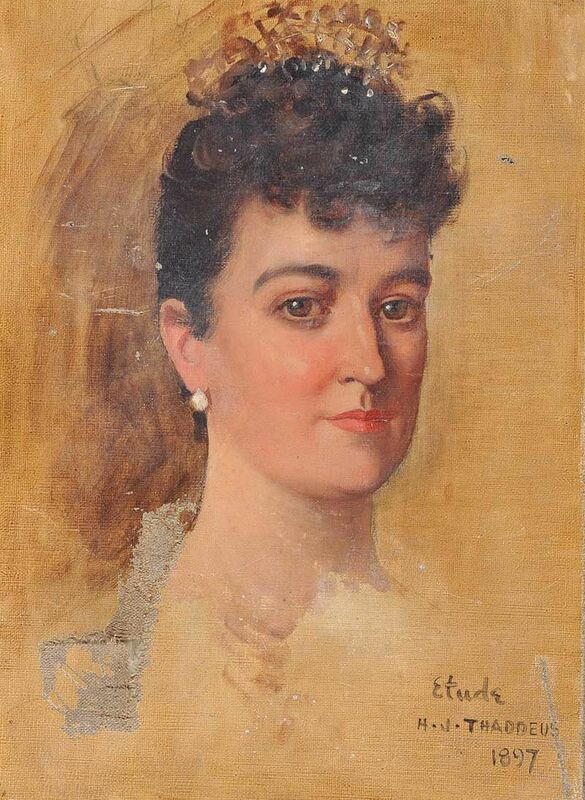 Sold at Whyte’s – 25/7/2016 for €1,500.00. 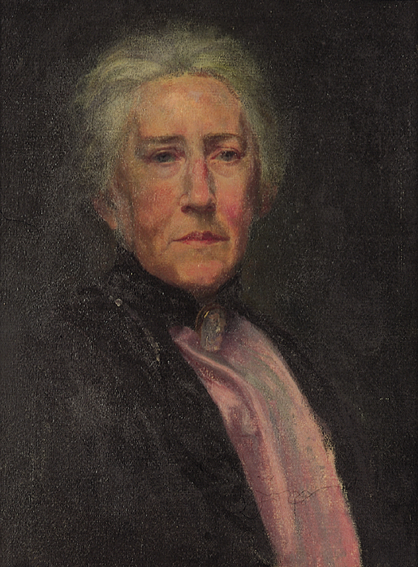 The Honorable Grace Mary Trench was the daughter of the 3rd Baron Ashtown, and exhibited with the Water Colour Society of Ireland and with the Waddington Galleries in Dublin. 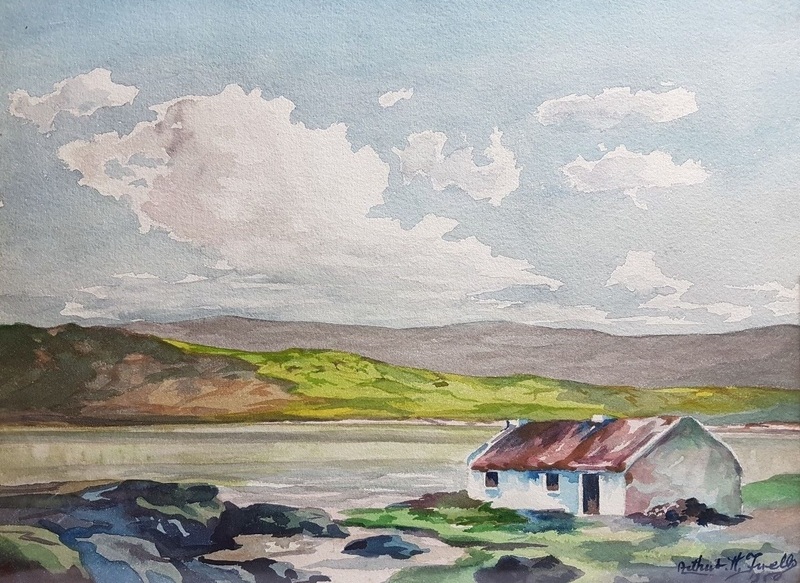 “New style cottages, Connemara” watercolour (10.5″ x 14.5″). 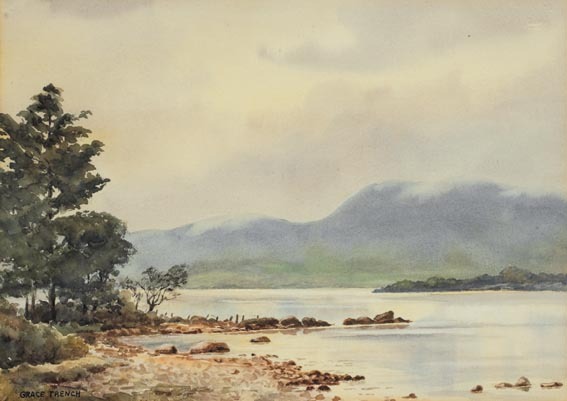 “Mist on Moylussa Mountain, Lough Derg” watercolour (11″ x 15″), sold at Whyte’s – 12/6/2005 for €350.00. 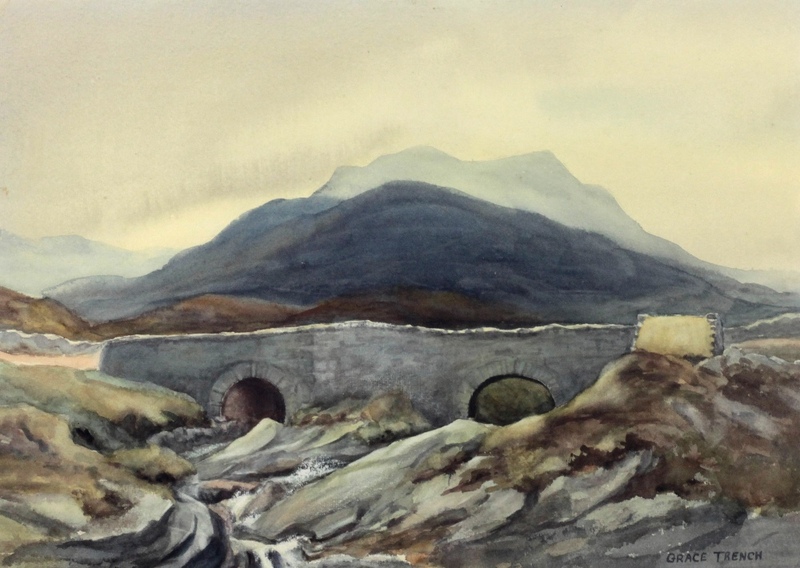 “The Old Bridge” watercolour (10.5″ x 15″), sold at Mealy’s – 10/10/2018 for €130.00. 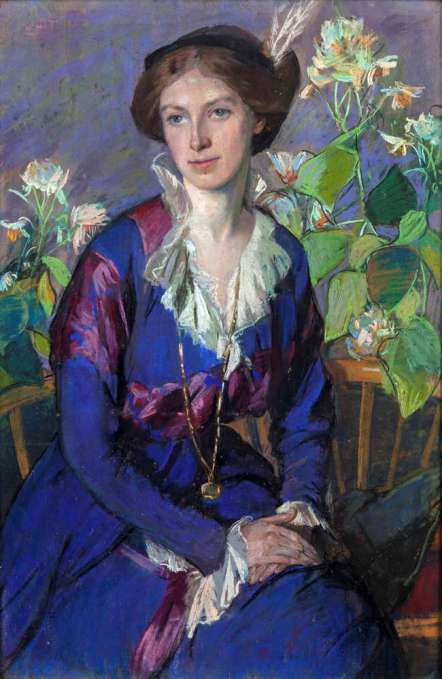 “Portrait of Catherine Bunbury, nee Horneck” oil on canvas (30″ x 25″), sold at Busby’s (Dorset) – 15/3/2018 for £1,600. Active 1920/40 period. 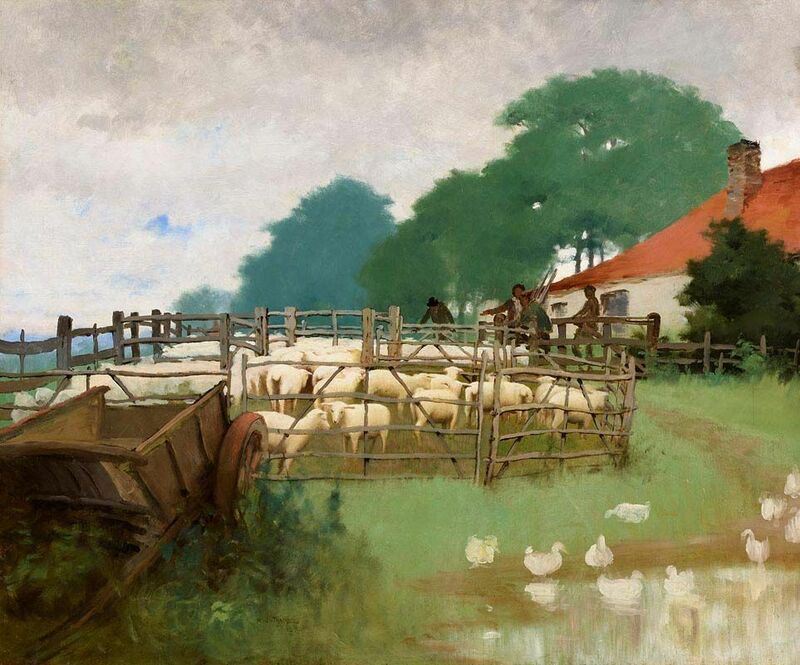 A prolific painter of landscapes, working, mostly in watercolours, including gouache. Trevor’s work is typified by his fine attention to detail and accuracy. 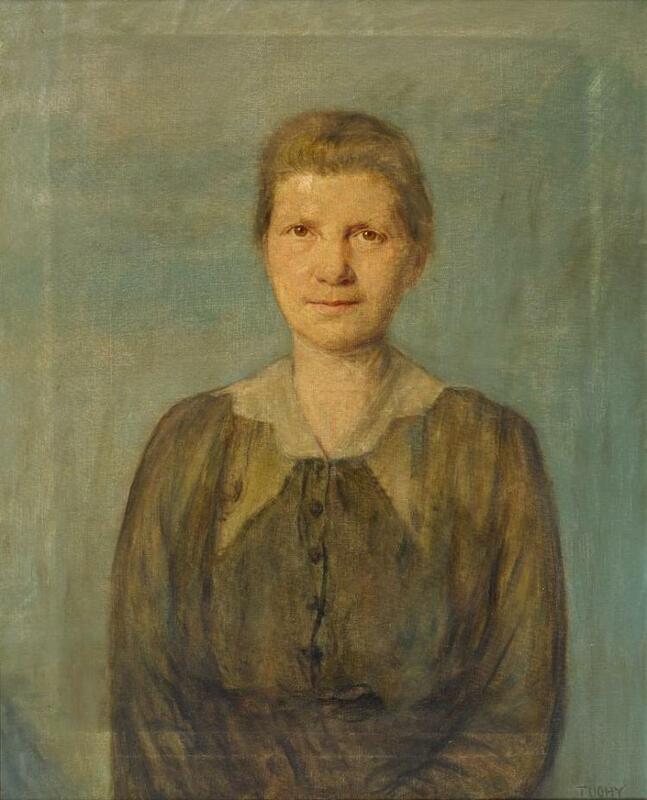 Helen Mabel Trevor was a Northern Irish landscape and genre artist. Born in Loughbrickland, County Down. 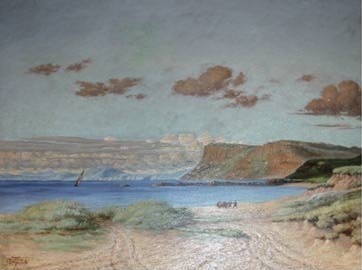 Left to right: “On the River Lagan” and “A Horse and Cart on a strand, with a view of Fairhead, Antrim, beyond“. 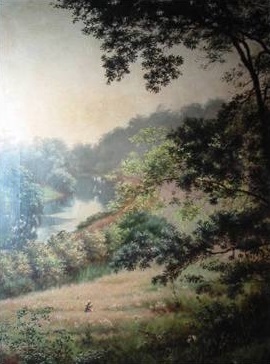 Both oil on canvas – dated 1884 and 1886 respectively. 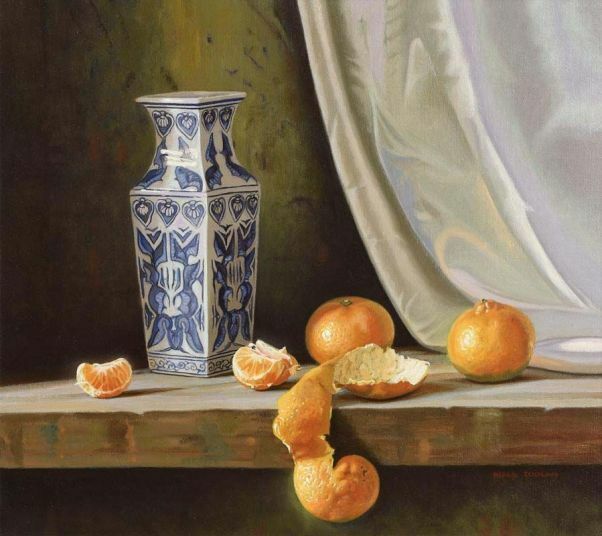 Ray Tsang was born in Dublin and attended Crawford College of Art and Design where he received an Honours Degree in Painting. 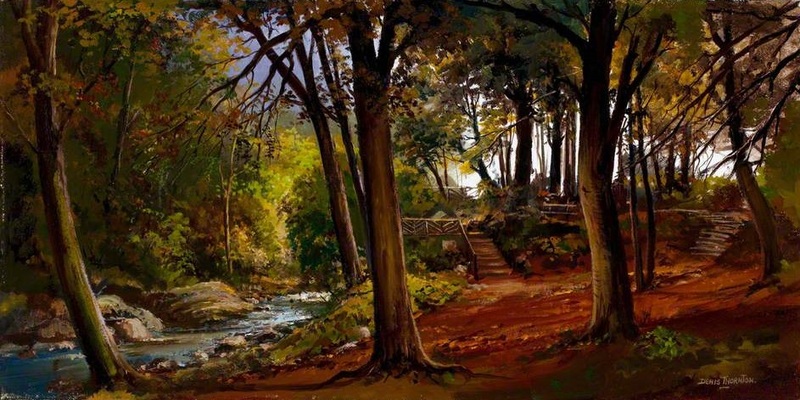 He is influenced mostly by Bravura, Impressionistic and Realistic styles of painting. 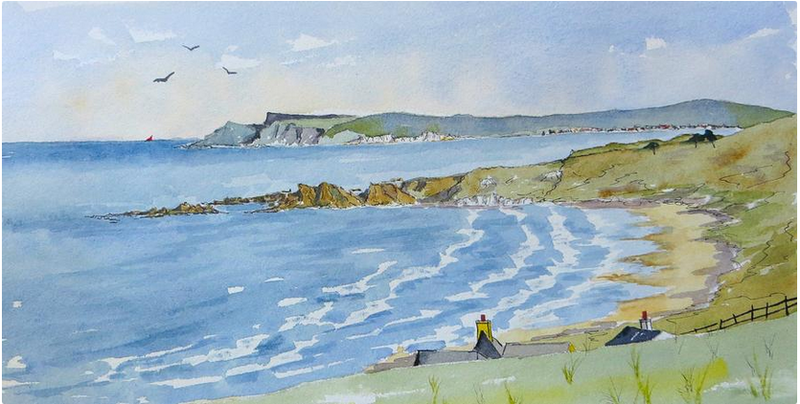 “Whitepark Bay” watercolour (11″ x 7″). 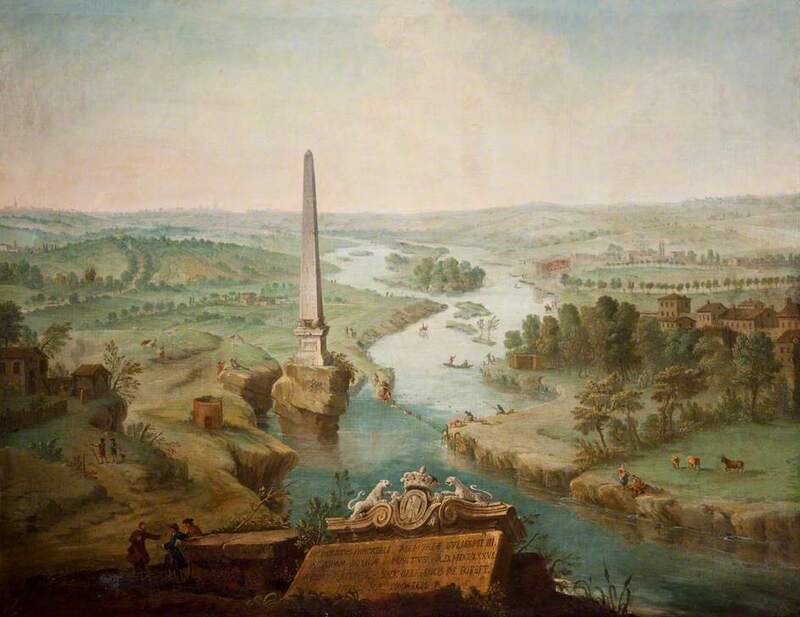 “The Obelisk on the Boyne” c.1746. The Obelisk commemorated the victory of King William III at the Battle of the Boyne but was destroyed by an explosion in 1923. “Portrait of a Woman with hazel eyes” oil on canvas (29″ x 23″), sold at Whyte’s – 26/9/2016 for €2,800.00. 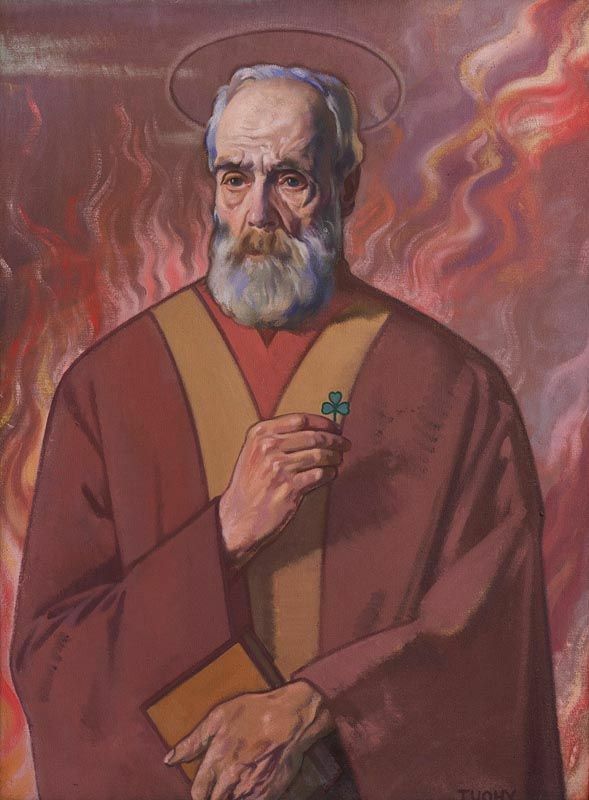 “St.Patrick” oil on canvas (33″ x 25″), unsold at Morgan O’Driscoll’s – 12/11/2018. 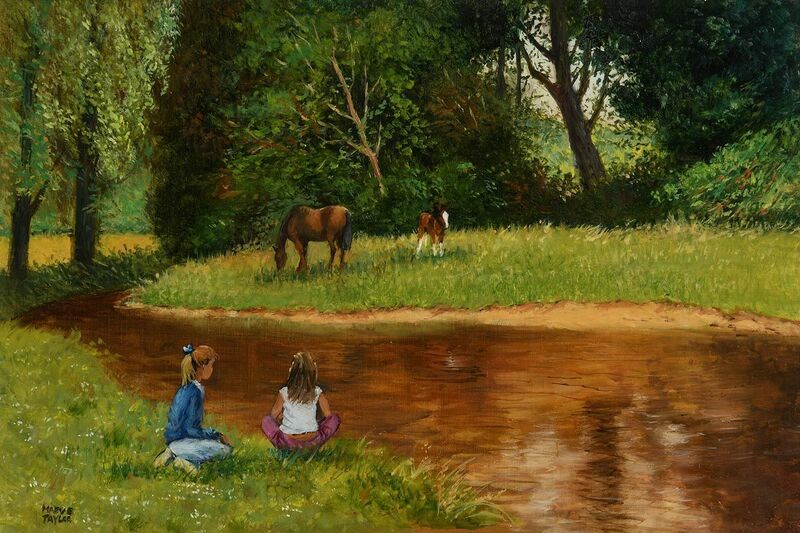 “Fishing by the Bridge” oil on canvas (12″ x 16″), sold at Ross’s – 31/7/2013 for £130.00. 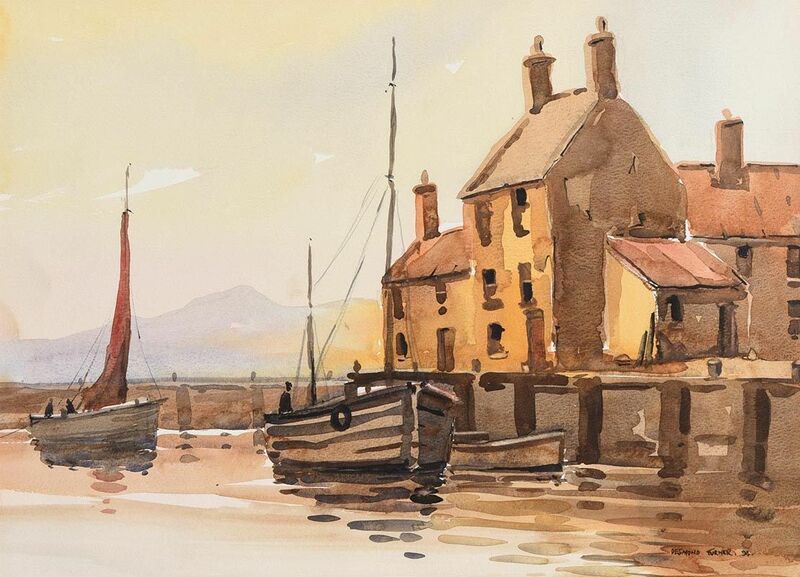 Left to right: “At the Quayside” dated 1994, watercolour, unsold at Morgan O’Driscoll’s – 8/8/2016; and “Lakeside Cottage” watercolour drawing (10″ x 14″), sold at Ross’s – 7/12/2016 for £50.00. 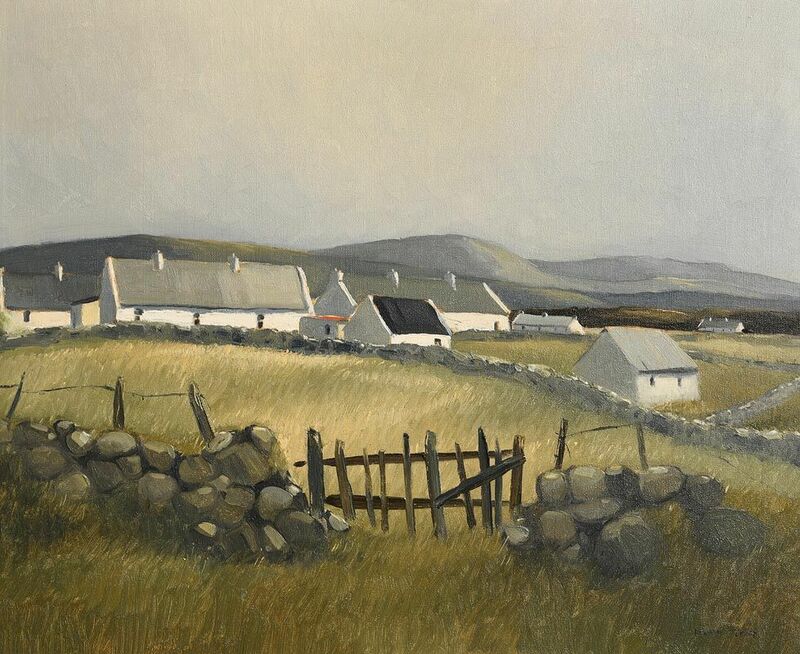 “Cottages in the Valley, Achill” oil on canvas (20″ x 24″), sold at Morgan O’Driscoll’s – 3/12/2018 for €400.00. 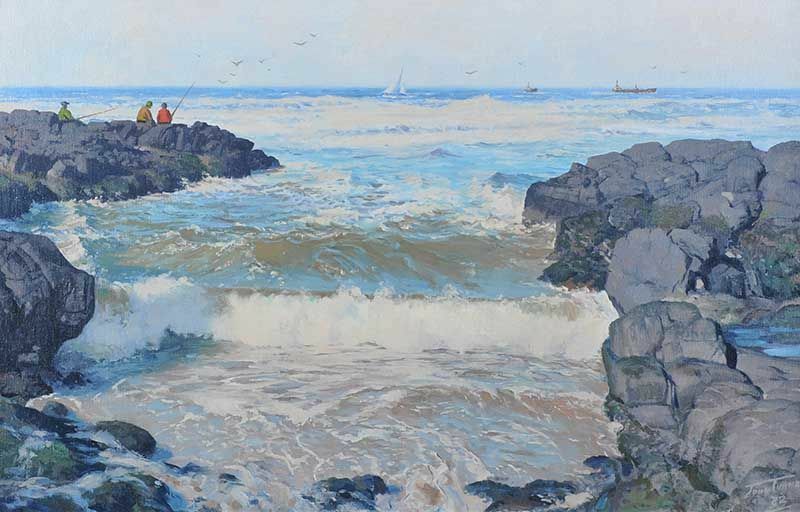 “Fishing off the rocks at Castlerock” oil on board (18″ x 28″), unsold at Ross’s – 5/10/2016. 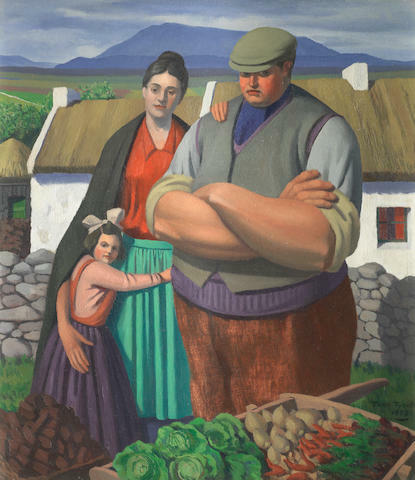 “The Donegal Family” dated 1953, oil on board (20.5″ x 18″), sold at Bonham’s – 10/7/2018 for £2,800. Belfast born artist now living and working in the English Lake District. 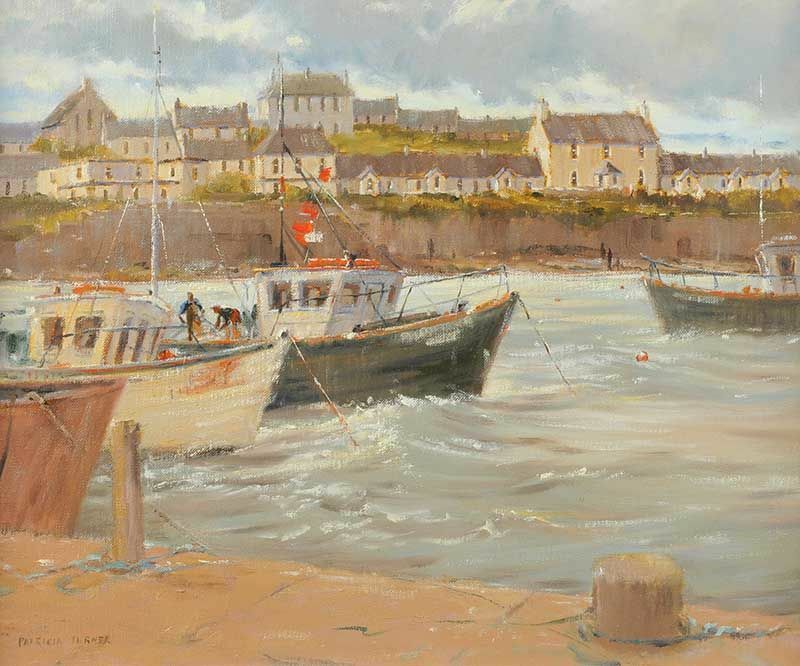 “Ballycotton Harbour” oil on canvas (20″ x 24″), unsold at Ross’s 28/6/2017. 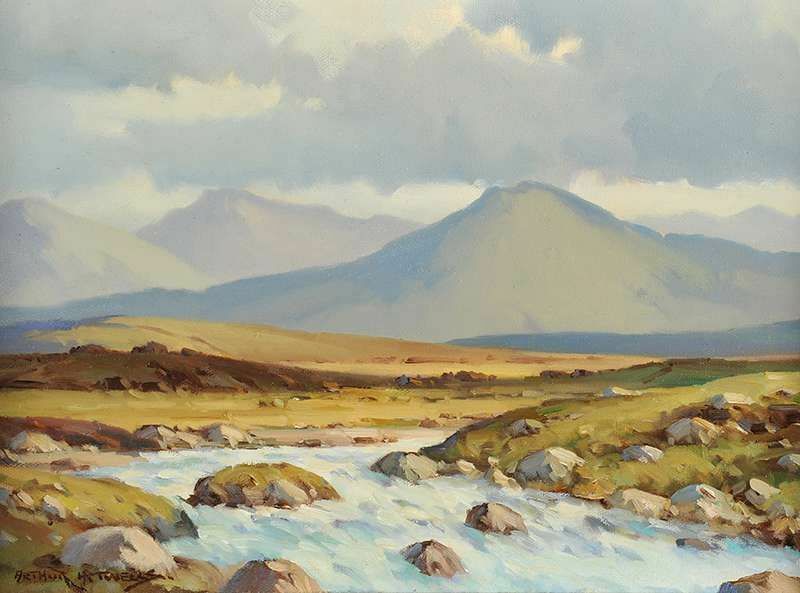 “Stream in flood, Maamturks, Connemara” oil on board sold at Ross’s – 22/4/15 for £180.00. 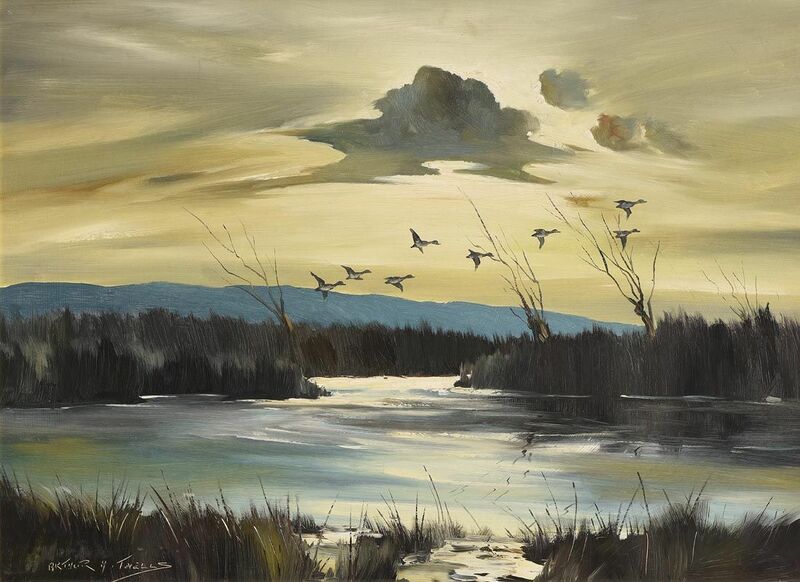 “Ducks in Flight” oil on board (20″ x 27″) sold at Morgan O’Driscoll’s – 8/8/2016 for €550.00; and “Winter Landscape” oil on canvas (9″ x 16″), sold at Morgan O’Driscoll’s – 26/6/2017 for €280.00. 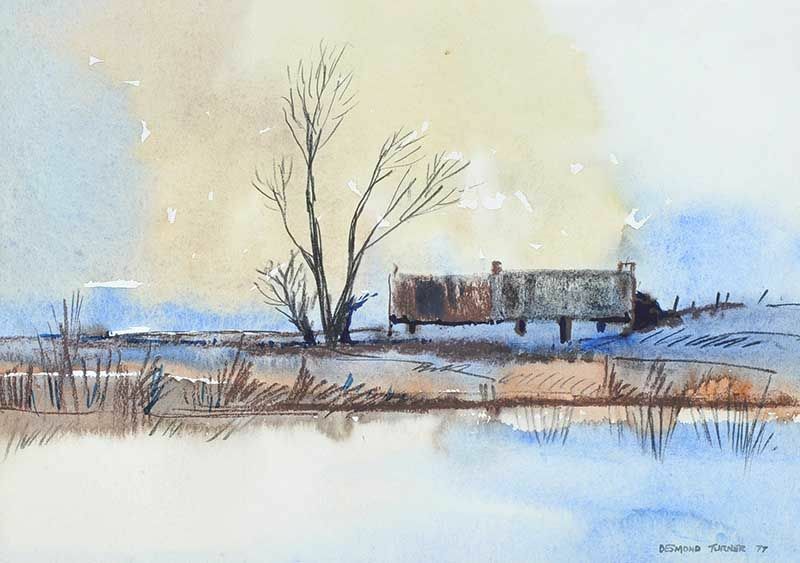 Untitled landscape dated 1950, watercolour (10″ x 13.5″), sold on eBay – 8/7/2017 for £65.00.